Pierre Baillot (Pierre Marie François de Sales Baillot) was a French violinist, composer, and teacher born on October 1, 1771 (Mozart was 15 years old.) 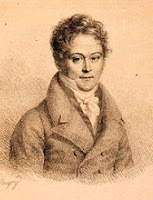 He is best known for his violin method (published circa 1805), written in collaboration with Rodolphe Kreutzer and Pierre Rode, for the Paris Conservatory. His own teacher was Giovanni Viotti, though he had studied with other teachers from an early age. After acting as private secretary to his main patron for five years – he had lost his father at age 12 – he was hired by the opera orchestra in Paris in 1791. He then gave this position up to work for the Ministry of Finance for a few years. (Charles Dancla did something similar.) Finally, after being offered a teaching position at the Paris Conservatory (1795), he devoted himself full-time to concertizing and even joined Napoleon’s private orchestra (1802) with which he did much travelling. He was also highly regarded as a chamber music player. He also wrote nine violin concertos which are no longer played. Baillot died on September 15, 1842, in Paris, at 70 years of age. Mozart and Beethoven had by then long been dead.